This unique ceramic wall sign is handmade in the Mountain Meadows Pottery studio in Vermont, USA. 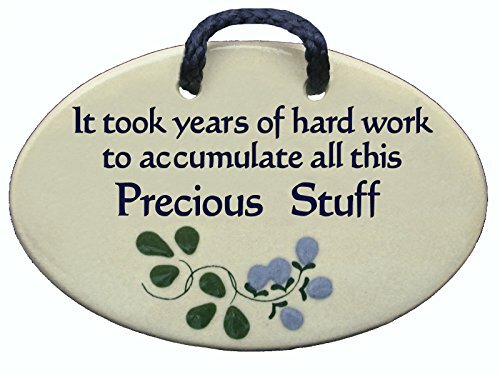 It is a perfect gift for collectors, hoarders, and friends or family who just have a lot of stuff. Each pottery plaque is made individually out of soft clay. It is decorated carefully one at a time. We mix all our own clay and glazes, and every single ingredient we use comes from the USA. Mountain Meadows Pottery wall and desk tiles have sentimental and funny sayings about working, wine, friendship and family. There are also Christian and inspirational quotes for many occasions and holidays and Irish sayings. The weatherproof nylon string allows it to be hung outside and the hand applied details are whimsical and charming artistic images of blueberries or original art created by artist Deborah Jurist. Mountain Meadows Pottery opened their Amazon Store in 2004, but we have been making and selling all kinds of pottery for over 30 years. Over the years, we have developed hundreds of sayings, creating new ones as the times change. When you make a purchase from Mountain Meadows Pottery on Amazon, you are buying only handmade items made in our Vermont, USA studio. We hope you will be impressed with the quality of our work. Reduced price offsets shipping cost for this piece sent directly to you by Mountain Meadows Pottery. Since 2007, Mountain Meadows has had a rating of 5 stars. SIZE Approximately 4" x 6" - People love receiving these plaques as gifts because they are a great size and fit anywhere. These pieces may vary slightly in size. They have a nice weight and feel, and truly show the quality of being handmade. If you have any questions about this product by Mountain Meadows Pottery, contact us by completing and submitting the form below. If you are looking for a specif part number, please include it with your message.